The Egyptian Black Sand Company, which belongs to the Egyptian military, has signed a deal with a Chinese firm to set up a joint Chinese-Egyptian company to extract minerals from black sands in Egypt, the military said in a statement on Tuesday. 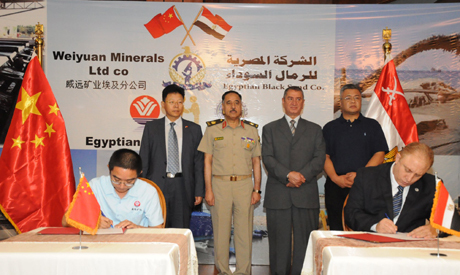 The new company that will be established in partnership with China's Welyuan Minerals aims to bolster Egypt's mining industry, meet local needs for minerals, and export the surplus, the statement said. Egypt's black sand deposits, found in the Nile Delta, mainly between the cities of Alexandria and Rosetta, contain substantial reserves of heavy minerals. The partnership with China will help equip high-calibre technical personnel in the industry while working together with international experts and maintaining international safety standards, the Egyptian Black Sand Company’s chairman Ezz El-Din Saleh was quoted as saying in the statement. He said the new venture will help make use of extracted minerals to set up national projects that help bolster the economy and offer thousands of job opportunities. The Egyptian Black Sand Company was established in 2016. The armed forces hold the majority of the company's shares, while the rest are owned by Kafr El-Sheikh governorate, the state-owned National Investment Bank, the Nuclear Materials Authority and the Egyptian Company for Mineral Resources. Last month, the company signed a cooperation deal with an Australian company for mineral extraction from black sands in El-Borolos area in Kafr El-Sheikh governorate.